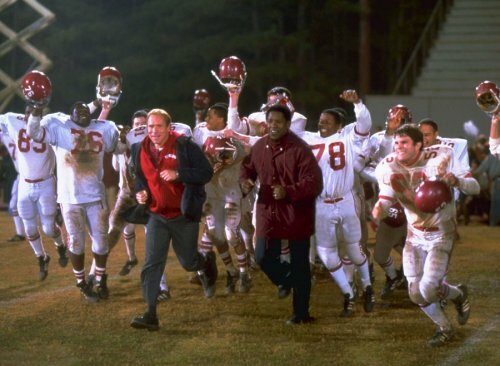 Some would argue that Remember the Titans is primarily a documentary of sorts on the subject of race in America. Others might say that it is a history lesson. To others still it illustrates the principles of teamwork and friendship. To me, however, Remember the Titans is first, and foremost, a football movie. I fully appreciated the authenticity with which this movie portrayed the game of football. It was exciting, tense, and very entertaining. There were great hits, passes, blocks, and catches. We were also taken into the huddle with the coaches arguing over strategy and plays. It was great. I watched this film in a packed theater. The crowd there was cheering and clapping the entire time, just as if this movie was an actual game. Accordingly, I must applaud director, Boaz Yakin, as well as Disney for making such a great football film. What makes this football movie so much more compelling, however, is the fact that it is based on a true story. Not only are we rooting for characters endeared to us by their struggles in this story, but we are rooting for real people. People like Gerry Bertier (Ryan Hurst) and Julius Campbell (Wood Harris), two students of different race, forced to attend the same high school, T.C. Williams in Alexandria, Virginia, as an all-white and an all-black school must integrate into one. They come together as teammates for their love of football. But dealing with each other becomes their most formidable opponent which, once tackled, allows them to score a strong and loyal friendship (I love these football puns!). The struggle of race, power, and honor within the small community of Alexandria is also personified in each of the coaches. There is the very successful, future-hall-of-famer, white coach, Bill Yoast (Will Patton, whom you may remember from Armageddon). 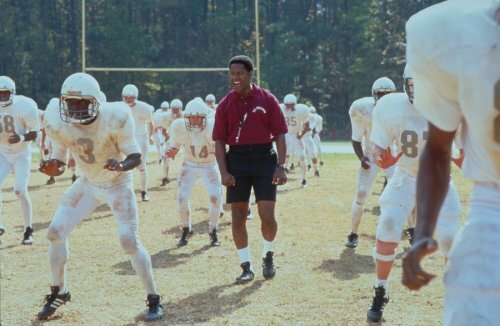 And Denzel Washington plays Herman Boone, the relatively inexperienced black coach brought in to replace Yoast as head coach. As you can imagine, such a setup provides immense conflict. How each overcomes it, especially that of Yoast, is a treat to watch. Not that this is all that relevant, but as I discussed the film afterwards with a friend of mine, we were amused by how the power struggle between Boone and Yoast, though not the focal point of the movie, is quite reminiscent of another of my favorite Denzel Washington movies: Crimson Tide. Finally, this movie captures well the sentiment that must have been prevalent on both sides of the race fence in this small community back in 1971. We see just enough of such characters as parents, neighbors, and students to get an authentic feel of their ignorance, their hatred, and their willingness (or lack thereof) to overcome it. However, Remember the Titans does have one fumble which ruins its perfect game. Although I enjoyed the cuteness and uniqueness of Yoast's little girl, Sheryl (played well by young Hayden Malorie Panettiere), the football-crazed assistant, I felt that they went way over the top with this one. This, and a couple of other minor points in the film, temporarily distracted me from the film and reminded me that this is still a Disney movie. While in general I really enjoy Disney films (I believe that in most cases they are a cut above the rest), some of that cutsiness and corniness was somehow inappropriate here. What I DO applaud the makers of this movie for, however, is its clean language and PG rating. This movie could have easily turned into an R-rated film based on the foul language that most certainly would have occured in real life at this most emotional time in Alexandria's history. And an R-rated film would have been defended, as it always is, for being "realistic." However, I believe that such language (in addition to visually disturbing scenes) is not necessary when making a point (e.g., The Godfather uses about 1 cuss word), and that by not using it while still conveying the same amount of emotion is a great achievement in and of itself. Furthermore, it allows a broader range of our population to see and enjoy this film, which is important in this case because of its strong and important message. I will now step off of my soapbox and step onto the bandwagon: Go see this film! It is a winner! How would you rate the movie Remember the Titans? There have been 30805 people to visit this page since Sat, Nov 4, 2000. And you are the first person to visit this page today!